If you are breastfeeding during pregnancy, you may be wondering what happens after your new baby is born. Nursing a new baby while an older one is still nursing is generally referred to as tandem nursing. This could be after a pregnancy and the arrival of a new baby or having adopted a new nursling while continuing to feed your older child. Thinking about tandem nursing will likely involve considering and weighing up many variables. As a breastfeeding mother, you are aware of how important nursing is to your relationship with your older child. Deciding whether to continue breastfeeding him along with a new nursling or to wean him deserves careful consideration of both of your changing needs. Many mothers find making this decision particularly difficult. You may be drawn to both options at different times. Taking one day at a time may be helpful if you are unsure of what to do. Getting support in making your decision will give you confidence that you are doing what is best for you and your child. If you do decide to tandem nurse, you are not alone! Many mothers have tandem nursed two, or even three, children and found that it works for their family. 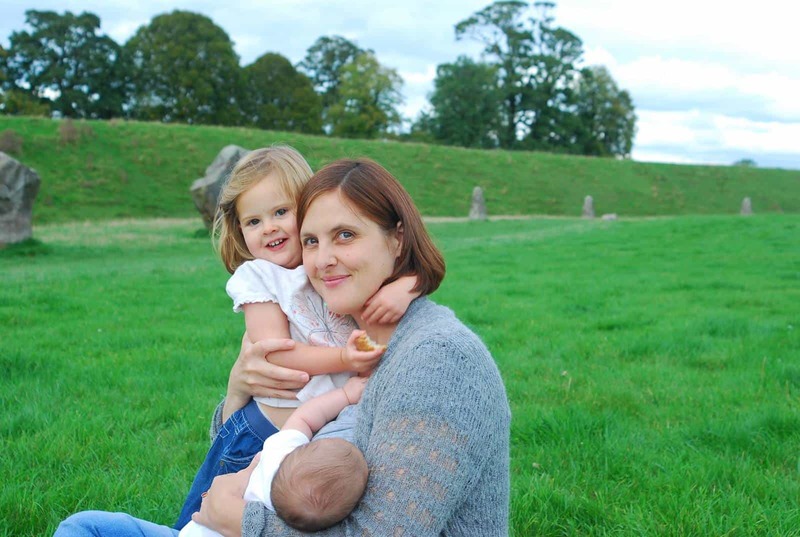 Children who have been tandem nursed often continue to have a special bond throughout life, and mothers report that tandem nursing can help to ease the transition of having a new baby in the family. Continuing to breastfeed your toddler through the stressful and highly emotional experience of gaining a sibling can help to make the transition smoother for them. They are less likely to be jealous of the baby who is allowed to breastfeed if they can nurse alongside them. The nutrition and immunological properties of breastmilk continue to be valuable and they can help your toddler through any illness, tantrums and fussy phases (“regressions”), which can sometimes occur. Nursing your older child once the new baby arrives can ease engorgement when your milk becomes plentiful and helps protect milk production if your baby is not feeding effectively. Breastfeeding during pregnancy is a special experience for both you and your nursling and recent research on the safety of nursing during pregnancy shows that there is usually no reason for concern (you can read more about this here). Your breastfeeding relationship may change throughout pregnancy to accommodate both your developing needs and the needs of your child. Around the fourth or fifth month (sometimes before), pregnancy hormones will probably cause your milk supply to reduce and its composition and taste to change. These changes may cause some children to nurse less or wean completely (you can read more about this here). Nursing whilst pregnant continues to meet your child’s nutritional and emotional needs and it can be an opportunity for you to savour your unique relationship with your older child, before your baby joins the family. However, it can also be a challenging time for you and it may invoke intense feelings. Getting support at this time may be very beneficial, and you may find talking to an LLL Leader or going to your local LLL meeting really helpful. Our Pregnant and breastfeeding? article has more information. Adding a new baby to the family has a big impact, no matter if it’s your second, or your tenth! Children, particularly younger ones, may not feel emotionally ready to accept this big change easily. It is a good idea to prepare your toddler and any older children by talking about a new baby coming. Reading stories together and showing them pictures of babies nursing can help them to be more accepting when their sibling arrives. Many mothers find that they don’t receive the same offers of support during second or subsequent babies as they did for their first. It is important to remember that as a mother nursing two children (or more), any support given will allow you to focus on mothering your new family. Try to get plenty of rest and eat well before the new baby comes. Actively preparing your support network before your baby arrives will make the transition easier for you all. LLL groups are a great place to meet like-minded mothers whose support can transform your mothering journey. You may be wondering how you will be able to provide for your older child during labour and whether she will be able to nurse or not. Having a dedicated caregiver for your older child who is able to give her expressed milk (if necessary) and get her to sleep will allow you peace of mind if you are unable to provide for her during labour. You may want to think about whether to have your older child with you during labour and birth or soon after the new baby arrives. If you are planning a hospital birth, you can inquire about access for your toddler and inform your medical team that you will want your toddler to be present during or soon after the birth. Some nursing mothers opt for a home birth, which usually allows more freedom for your older child to be included whenever you want her too. Breastfeeding releases oxytocin and can help to progress a slow labour. However, many mothers prefer to focus on the act of birthing and choose not to have their older child with them until the new baby has arrived. Your baby’s first breastfeed is a really special time. If your older child breastfeeds at the same time, this special moment will be part of their memories too. Any stitches you have had from a tear, episiotomy, or C-section will need to heal and you may find positioning your baby, older child or both challenging and may need a helping hand. When a baby arrives early or there are birth complications, it can be a really difficult and stressful time, which often involves a hospital stay and being separated from your older child. Although your newborn will need to take priority, trying to have your toddler for short visits whenever possible can be really helpful. If your newborn is unable to nurse right away, your older child can continue nursing and protect your milk production. When you give birth your body will continue to produce colostrum, with milk becoming plentiful after around 3-5 days. As with your previous baby, you will need to nurse at least 8-12 times per day to establish your milk production. You may worry about your newborn not getting enough colostrum if your older child is feeding too. Some mothers feed their newborn baby first or encourage the older sibling to nurse less if they feel their baby is not feeding enough. Look out for feeding cues and give your baby unrestricted access to your breasts to help ensure he gets plenty of milk. The more milk is removed, the more will be produced. Feeding cues to watch for include rapid eye movement, moving hands, squirming or rooting. Good positioning and a deep attachment at the breast will help your newborn feed effectively. Encourage your baby to finish one breast before switching to the other. If you are expressing milk for your baby, your toddler’s nursing will help your supply. Hands-on expressing while your toddler is nursing may be particularly effective. See our page Is My Baby Getting Enough Milk for further information. Toddler nursing like a newborn? You may find that once your baby arrives your toddler starts nursing frequently again, just like your baby. Older siblings may enjoy increased milk supply, or simply be thinking about breastfeeding more as they see the baby breastfeeding often. If your toddler does increase his milk intake, he may lose interest in solid foods for a while as he enjoys your newly increased milk production. He may have looser stools. If you are happy to nurse your toddler as much as he wants, it can be a lovely bonding experience for the three of you. However, if you are feeling overwhelmed by his requests or not keen on nursing so frequently, you might like to try negotiating with your toddler about when and for how long he is allowed to breastfeed. See ‘Feelings’ section for more ideas. You may prefer nursing your baby and your toddler separately or breastfeeding both nurslings together. Your older child can access your breast in many creative ways! It can take a while before your body adapts to the needs of two different nurslings. Sometimes you may feel lopsided if one breast has been drained more than the other. Eventually things will settle down and you’ll have your own individual rhythm. Alternating breasts for each feed helps with development of newborn vision and keeps the size of your breasts balanced. However, some mums find that giving a toddler his ‘own side’ works for them. Just as with nursing one child, there are many different tandem nursing positions you can use which are comfortable and allow for milk to be removed effectively. You may need to experiment to find out what works for you when feeding two nurslings at the same time. Your older child might also have strong opinions about how she likes to nurse! If you plan to tandem feed out of the house, it might be worthwhile practising a few positions at home first, so you know you can get both nurslings on and off easily. Some mothers find it easier to position the baby first and let the toddler climb on, while others prefer to position the toddler first and then add the baby. Your toddler is positioned curled around or underneath your baby, with each child’s head supported by your arms. Your toddler sits or semi-reclines with legs pointed away from you. Your baby is held underarm with his feet away from you. This position is good for protecting caesarean stitches or if your toddler sometimes kicks or disturbs your baby. Your toddler is positioned laying down next to you, then the baby is perched on top of your toddler. There are many other variations and combinations of the above positions which you can try. For more information about feeding positions for a single baby, see Positioning and Attachment. With each pregnancy your body makes more milk and an abundant milk supply/forceful let-down can be challenging for your newborn. Your older child might oblige and deal with the fast flow; otherwise, expressing just a little milk into a towel until the flow eases may help your newborn. Tandem nursing is a big commitment and emotions can run high at times. You may experience huge highs, deep lows, find it too demanding, and think it is magical, all within a short space of time. It can feel as if it will be this way forever, but it might be helpful to remember that babies are small for a short period of time and the dynamics between you and your two (or more) nurslings will soon change. Having realistic expectations about what you can manage at this point in time can be helpful. As a tandem nursing mother, you and your breasts are a focal point for nourishment and care for both of your nurslings. This can feel overwhelming and at times you may feel breastfeeding aversion or agitation. This can manifest itself in feeling ‘touched out’ and having the urge to limit your toddler’s nursing. Your reaction may be mild or quite severe with strong urges to stop feeding your older child. Many mothers report that the nursing agitation they feel is not an accurate reflection of their feelings about breastfeeding or their relationship with their toddler. In this case it may be helpful to do some detective work about why you may be feeling like this. You might realise that you are unwell, need more rest, are not eating well, are stressed about something, or are experiencing a bit of mother burnout. Prioritising self-care and having some time alone can really help to rebalance your mind and recharge. Carving out time for yourself, even if it is only 10 minutes, can give you the strength to manage. Taking time to rest is also important, and you can try to take advantage of daytime opportunities for a nap. If you want to put some limits on your toddler’s nursing, you might like to try negotiating with your toddler about when he is allowed to breastfeed, setting gentle limits about the length of his feeds by counting or singing, or pre-emptively offering snacks or playing games with him. Finding support from other tandem nursing mothers gives you an opportunity to talk things through with someone else. LLL meetings are a great place to meet tandem nursing mothers. When tandem feeding, you may be constantly thirsty, hungry and tired. It’s important to look after yourself by taking every opportunity to rest together and by eating plenty of nutritious snacks and meals. Feeding both children at the same time during the day is a great opportunity to try putting your feet up and relaxing. Accepting offers of help with shopping, housework and cooking from family and friends can be extremely helpful. Taking a few moments to nurture yourself can help avoid feelings of stress or exhaustion. Self-care is an essential part of mothering, particularly when your body is undergoing such large changes and ongoing demands. Try to make your needs clear to your partner/support person, as they will be better able to help you if they know what you need. Trying to keep expectations realistic reduces stress for you and the rest of the family. Particularly in the early days, your priority is looking after your new baby and older child(ren), so be kind to yourself. Tandem nursing puts physical demands on your body as you produce enough milk to nourish two children. Fatigue can be a warning sign that you are not keeping up with your calorie intake requirements. It is a good idea to drink to thirst and eat as normal using your appetite as a guide. Managing bedtimes with two nurslings can be a bit tricky. If you plan to breastfeed both children to sleep you might find you can feed both simultaneously lying down, then move one child once asleep. Or it might work better to have someone else available to hold/entertain one child while you nurse the other to sleep, then nurse the second child to sleep afterwards. It is possible to nurse both children during the night, but you may need to do some experimenting and find out which positions work for you. See our Safe Sleep and the Breastfed Baby article for more information on safe sleeping practices. You may choose to night wean your toddler, but this might result in considerable effort and sleep-loss in the short term during the weaning period. It is helpful to consider whether night-weaning will lead to more sleep for you or if it will be more disruptive. If you do decide to night-wean, it can be helpful to have someone else put the toddler to sleep and go to them if they wake during the night. Children react in many different ways to the birth of their new sibling. It is common for children to find it difficult to adjust to a new family member. 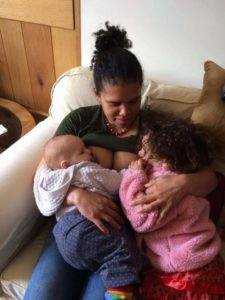 As a tandem nursing mother, you may find that nursing your toddler (with or without baby) offers a welcome sanctuary from the stresses of the new family dynamic. 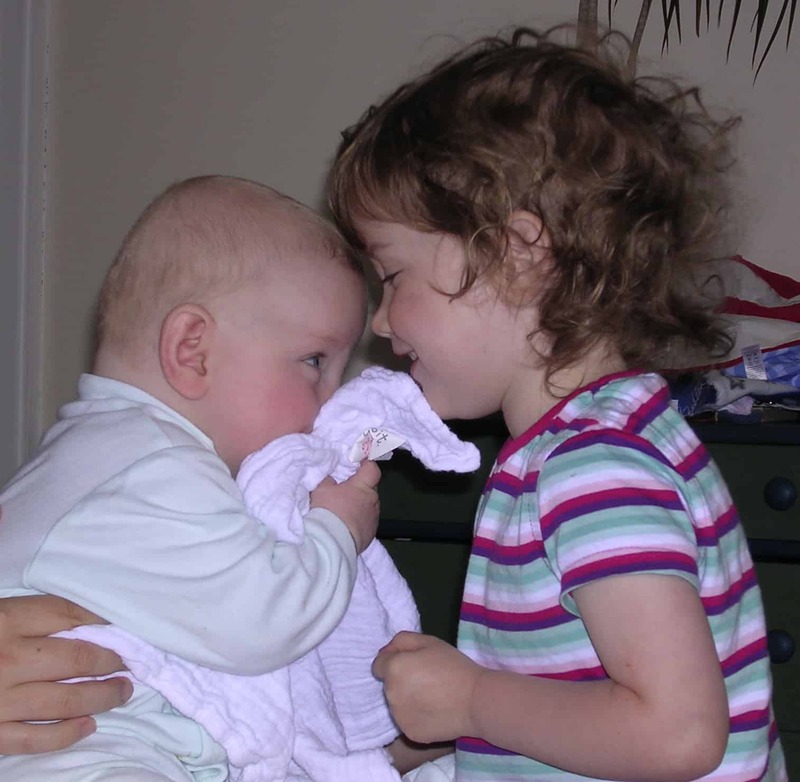 Tandem nursing siblings often have an added bond as children and can have a special relationship throughout their lives. Keeping your toddler occupied while breastfeeding your baby may be a challenge you have not faced before. It can work well to set clear expectations about breastfeeding, so your older child understands what he is allowed to do during nursing time. Some older children react well if you give them a warning before you start breastfeeding your baby. It might also work well if you feed your baby in a sling, so your older child may not even notice your baby is nursing. Ask your toddler to help you out, for example bringing you a nappy, a muslin etc. For some mothers tandem nursing continues for quite a while. Others decide that weaning an older child and nurturing their relationship in a different way works better for them. If you decide to stop breastfeeding your older child, keep in mind that it may be a gradual process and one which needs gentle encouragement and patience. Our Thinking of Weaning? article has information on weaning strategies. Talking to an LLL Leader can help you decide what is going to be best for your family. Choosing to breastfeed your adopted baby is a wonderful way of bonding with her. As a mother who is already nursing another child, you are in the good position of already having a milk supply flowing. You will probably need to increase your supply to cater to your new baby’s needs. See our article on Relactation and Induced Lactation for more information on how to increase your supply and how to supplement your baby if needed. Tandem nursing your adopted baby and your toddler can create a special bond between all three of you which could last for life. However, breastfeeding your adopted baby may be challenging and you will benefit from a strong support network. Your local LLL meetings can be a great place to find this support.